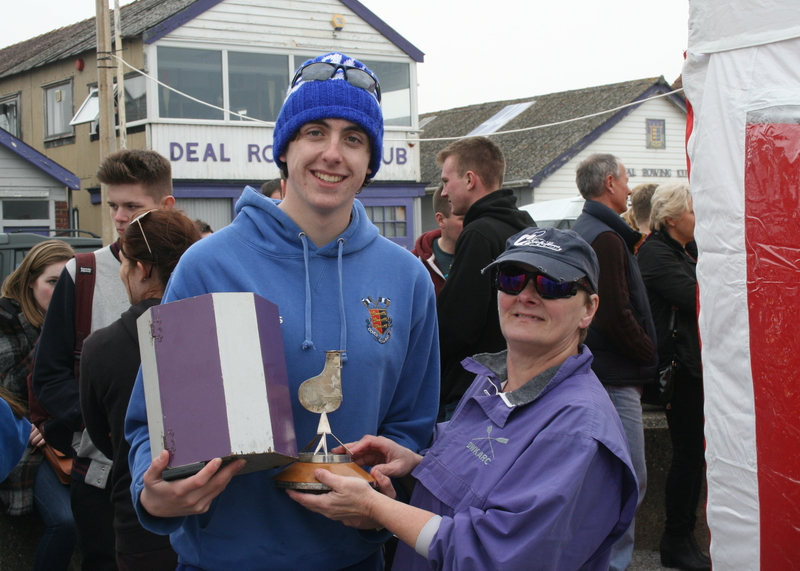 The Viking Shield Regatta at Deal saw great performances from Dover rowers in the last preseason event before the CARA season begins in May. 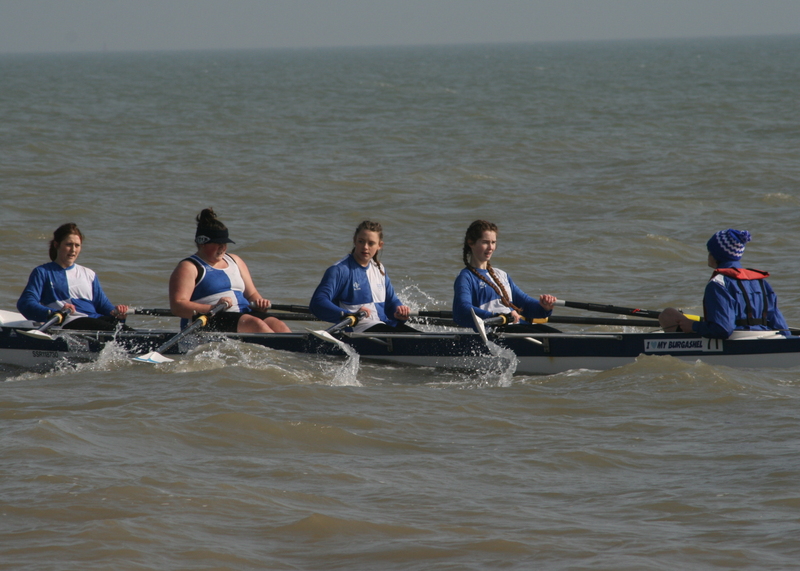 The opening event saw the Astor girls crew of Jodie Lott, Antonia Reed, Megan Barter, Olivija Norvilaite with cox Chris Hall compete in the J16 category. A strong start saw the young crew jump out into a lead over both the boys and the girls race. Working hard they held off the Deal boys crew to the last 20 metres of the course and secured their first win in a J16 race. 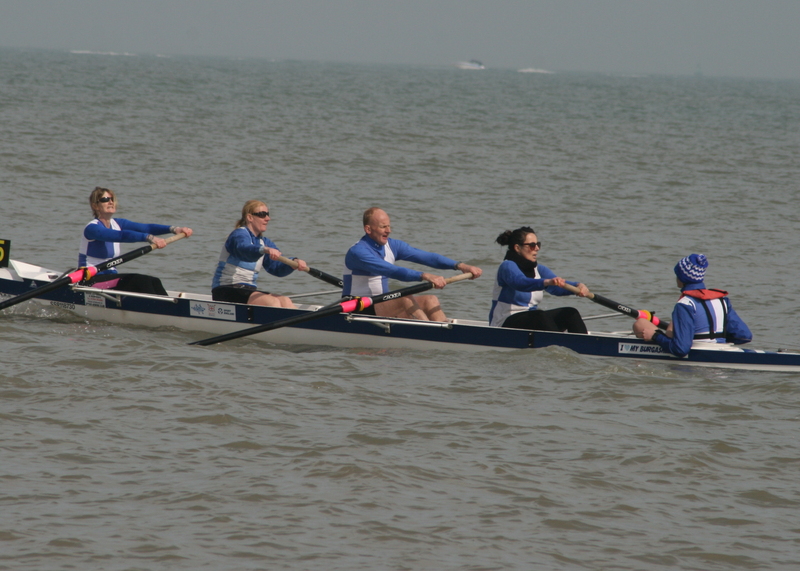 The next Dover race saw Lizzy Foley, Lisa Burnett, Maria West-Burrows, Petra Matthews Crow, coxed by Jo Johnston racing in the Junior Ladies 4. A good start saw them among the leading boats. They were well coxed around the first buoy turn by Johnston which helped them jump out to a clear second place where they held off a charge by the Deal crew. They secured their second position by the second buoy for a comfortable run to the finish line. The Men’s Junior Sculls race saw possibly the worst conditions of the day. Dover were represented by Hall and Chris Price. Hall powered off the line to take a three length lead to the first turn with Price running in the middle of the field. 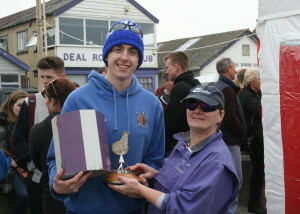 Hall was challenged by Bexhill scullers in the middle of the race before he eased away for a comfortable win with Price coming home in fifth in a race that saw two competitors fail to finish. 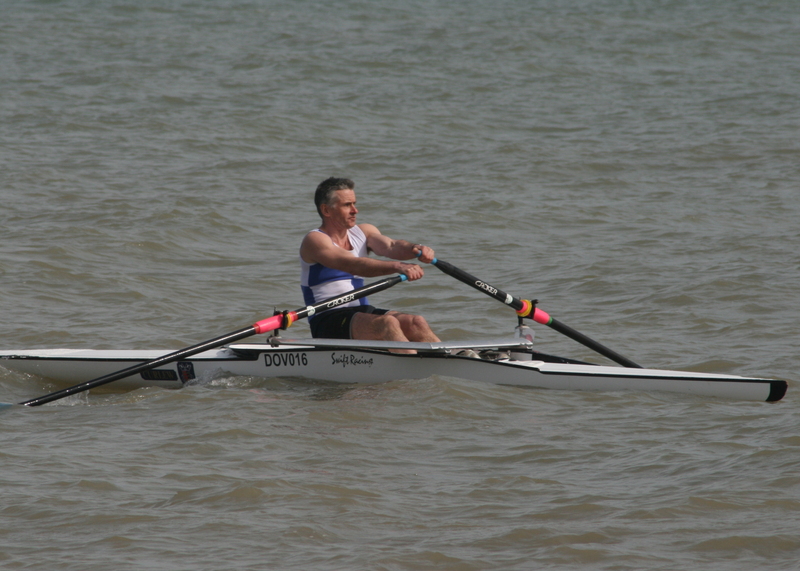 The Men’s Novice Sculls race saw veteran rower Paul Scrivener as Dover’s sole entry. Scrivener dominated from the start jumping out to a significant lead by the first buoy. His consistent power through the stroke saw his lead extend to several lengths at the second buoy and finish ten lengths ahead of his nearest challenger to take a very deserved win. Due to withdrawals from other clubs the Veteran 40 and 50 were run in a single race. 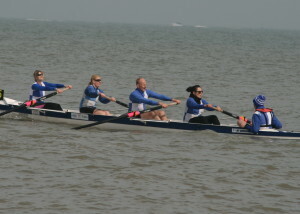 Dover’s Vet 40 crew was Chrissy Purvis, West-Burrows, Tony Burrows, Matthews Crow coxed by Hall; the first time the Burrows had raced together in their long rowing careers. The Vet 50 crew consisted of Burnett, Scrivener, Nick Bailey, Johnston coxed by Foley. From the off the Vet 50 crew gained the upper hand over the younger Dover crew and, despite their best efforts, the Vet 40 could not close the gap. At the second buoy both crews executed the turn well leaving the Vet 50 crossing the line in second with the Vet 40 crew finishing third which was sufficient to take the victory in their category. The Junior Men’s 4 crew of Cameron MacIntosh, Austin Mills , Hall, Tom Stothart with cox Foley had a terrible start with the crew backing down as the umpire started the race leaving them last off the line. Chasing the field down to the first buoy Dover’s young crew overhauled one boat but were unable to get in among the main field trailing in seventh place. 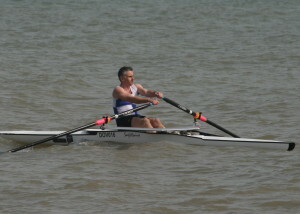 Price had better luck coxing the Eastbourne crew to second in the same race. The Novice Ladies crew of Casper Barnsby, Reed, Mary Newcombe, Amy Lewington, coxed by Burrows performed well in their first race together. Working hard off the line they were initially in the lead before gradually being passed by four boats after the first buoy turn. They maintained their fifth place throughout the rest of the race. 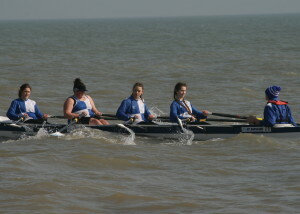 Dover had two crews in the Ladies Double Sculls which saw Barter and Burrows racing Johnston and Newcombe. The composite crew in the race jumped out ahead of Barter and Burrows then, cutting across their line, slowed the Dover boat down. At the turn Barter and Burrows clearly had an issue and withdrew from the race, leaving Johnston and Newcombe chasing the leaders down the course to secure second place. A total of four wins leaves Dover with hopes of a good season ahead.